As we always say the "Good" news about Disney World is that they give their guests SO many choices....The "Bad" news about Disney World is that they give their guests SO many choices! Disney Dining Plans are just one of these Disney vacation choices. Purchasing a Disney Dining Plan up front is a big decision for many families counting their pennies. 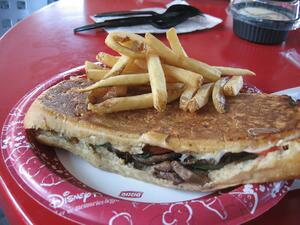 Deciding on the right Disney Dining plan for the needs of your family is key here. We wanted to walk you through a few basics here to help you make the RIGHT choice for your family. Is it worth it? We believe the answer is YES on many levels. The big perk for many vacationers is that it's nice to know the total cost of your vacation up front. You can use our Free Vacation Layaway to budget accordingly. Who wants to sweat and worry every time you flash your credit card to pay the bill? Food is expensive when you buy it in a theme park because you are a captive audience. Orlando is full of theme parks so even area chain restaurants outside of the theme parks charge a premium price. Cook your own meals? - well there goes the idea of a "vacation" and area grocery stores also have higher pricing than the food stores back home because they too are located in a tourist area. If you are planning on enjoying a few character meals with the kids it is ABSOLUTELY worth the dining plan. If your family likes to have a sit down meal every day to enjoy not only an amazing variety of offering, but just the time to enjoy your family in a relaxing venue, then yes again. Even if you're not big eaters or have kids who are picky eaters, the quick service dining plan will give you all sorts of fabulous food choices "on the fly". Quick Service does not mean a week of eating burgers and fries which is one myth we often hear. You can eat any choice from a Disney self-serve dining spot so yes burgers but also Mongolian beef, tofu salad, lobster roll to inter-world menus with a unique Asian flair and more. One great tip for the quick service dining plan is that here kids can order from the adult menu. So your small eaters might share a single meal and stretch that dining plan a little further. Everything is recorded and tallied on your Magic Bands so the only decisions you have to worry about is what to pick from all the delicious choices. Meals now even include specialty drinks and beer and wine – you will still need to add gratuities at table service meals (which you can charge back to your room if you like). Food allergies or special diets - No worries! Even in the quick service restaurants, Disney chefs will personally speak with you, discuss your special dietary needs and prepare meals to order. Disney Resorts - You MUST be a guest staying at a Walt Disney World Resort in order to qualify for one of the Disney dining packages. If you are staying at a hotel outside of Disney World - Fuggetaboutit! This is one perk not offered to Good Neighbor Resort guests. Not only can you use your Disney Dining Plan inside all four Disney World parks but every Disney World Resort offer dining venues so you can use your dining plan even if you are taking a day off to enjoy the pool, water parks or Downtown Disney. 2 Quick Service Meals, per night of your resort stay at a counter service restaurant which includes one entree and one non-alcoholic (or alcoholic for guests over age 21) beverage. 1 table service entitlement, per night of your resort stay. The table service meal will include an entrée, and non-alcoholic (or alcoholic for guests over age 21) beverage per guest. Snacks: a “snack” at Disney World refers to anything from a bagel to a Mickey Bar to a fruit bowl. Typically snacks range in cost from $4 - $8, and can be purchased in resort gift shops, snack bars, small kiosks around the parks, or as a la carte items at the counter service restaurants. If you're not a big breakfast eater you can use your snack for a bagel or fruit to start your day. Counter service restaurant: A restaurant where guests order their meal at a counter, wait to have it handed to them, and then take it back to a seat in the restaurant. Counter service restaurants do not require reservations and can be found at all parks, Downtown Disney, water parks, and at the resorts. A counter service entrée averages $15, $8 for children, and soft drinks average $4 but can vary. Signature Service: a higher valued restaurant at Disney World where guests using the dining plan or deluxe dining plan will need to use two table service credits instead of one. Examples of these include Cinderella’s Royal Table, Le Cellier Steak house in Epcot, the Hoop de Doo Review dinner show, and the Aloha Dinner Show at the Polynesian. Hopefully this will give you some of the basics and help you make the right dining decisions for your family. We know many folks enjoy the thrill of booking their own Disney World Vacation but PLEASE KNOW there are so many ways one of our Travel Agents can help. For example, once you choose your dining plan, our agents will make your dining reservations for you (this can save you HOURS!). They can help you plan daily park itineraries and offer suggestions on how to leverage your meal plans to get the most out of your dining experiences at Disney. They have many more secrets and tips that will make your experience even more magical....all for the same price as if you make your own reservations. So talk to one of our Vacationkids Disney Experts to get all the facts.